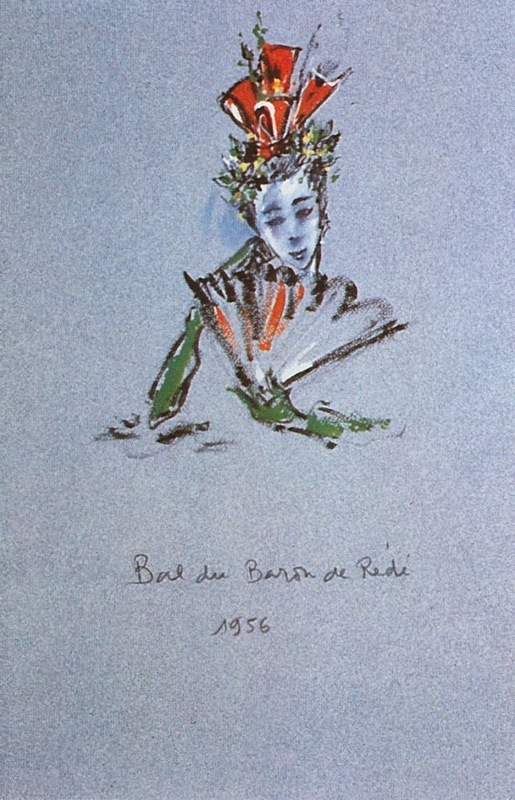 Although the late Baron de Redé, the noted French aesthete, host, and financier, might be better known for his 1969 Oriental Ball, he is almost as famous for an earlier fête: his "Bal des Têtes", which was held in 1956 at Hôtel Lambert, Redé's Paris residence. 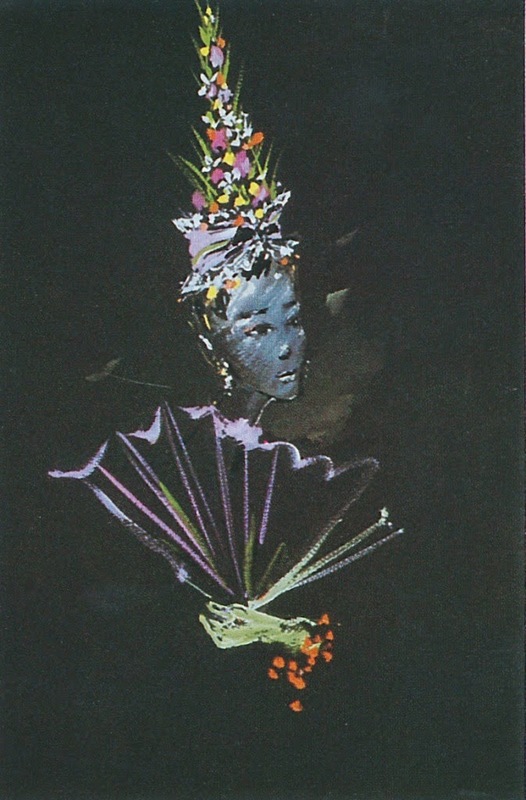 As the title of this blog post indicates, the ball's theme was headdresses, with guests encouraged to wear fanciful creations. 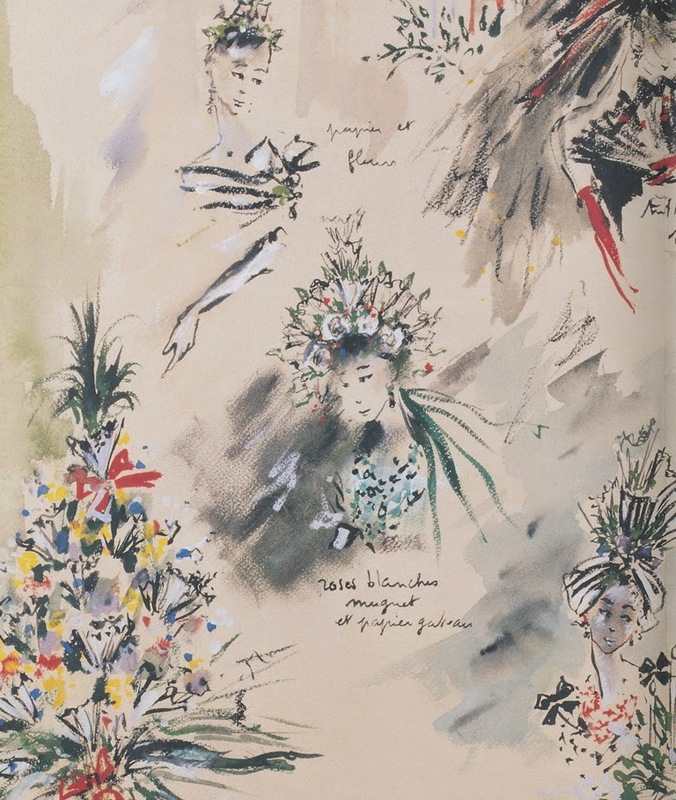 Redé asked three of his guests, Elsa Maxwell, the Duchess of Windsor, and Charles de Beistegui, to help him judge which party-goer wore the best headdress. 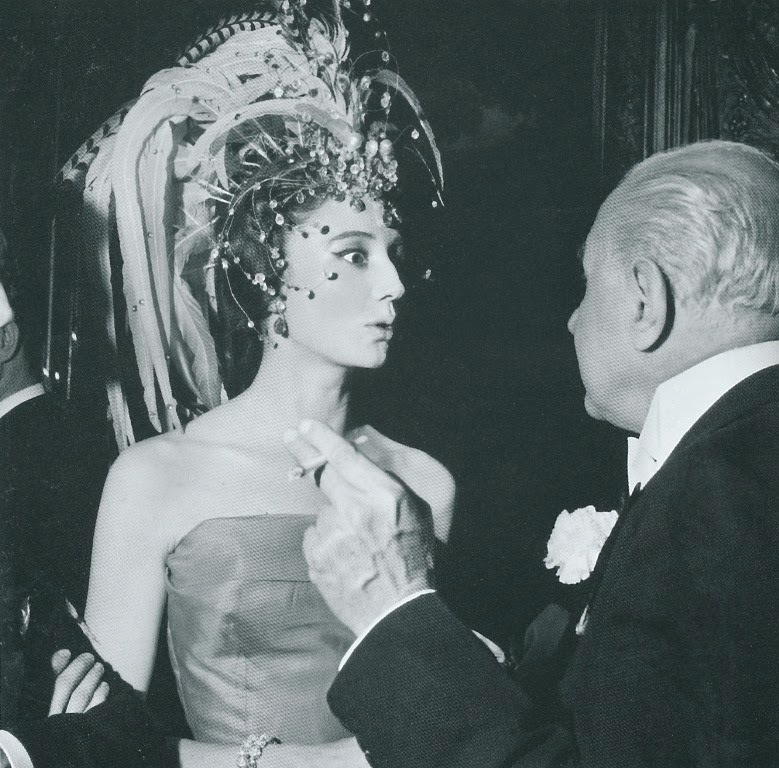 The winner was Jacqueline de Ribes, who modeled a most fetching feather-and-jewel number. 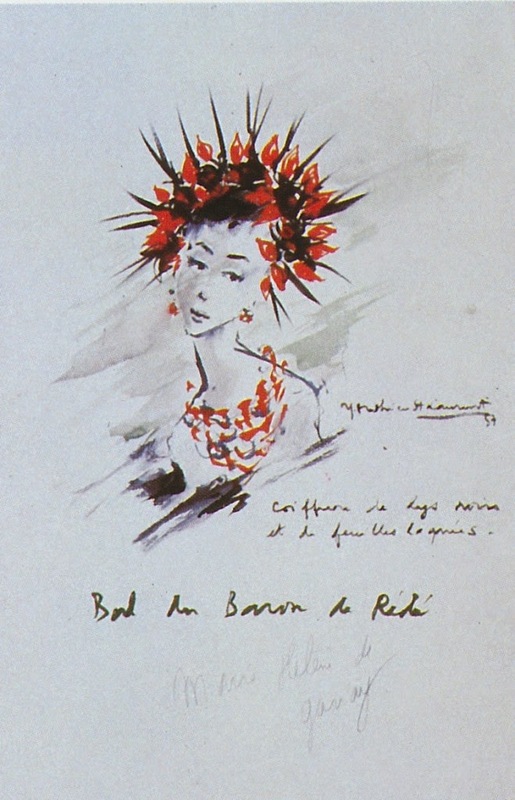 According to Redé's memoirs, Yves Saint Laurent, then an assistant at Dior, was hired to design the ball. I don't know the extent of Saint Laurent's contributions, but I do know that he designed a number of headdresses for some of the lucky female guests. 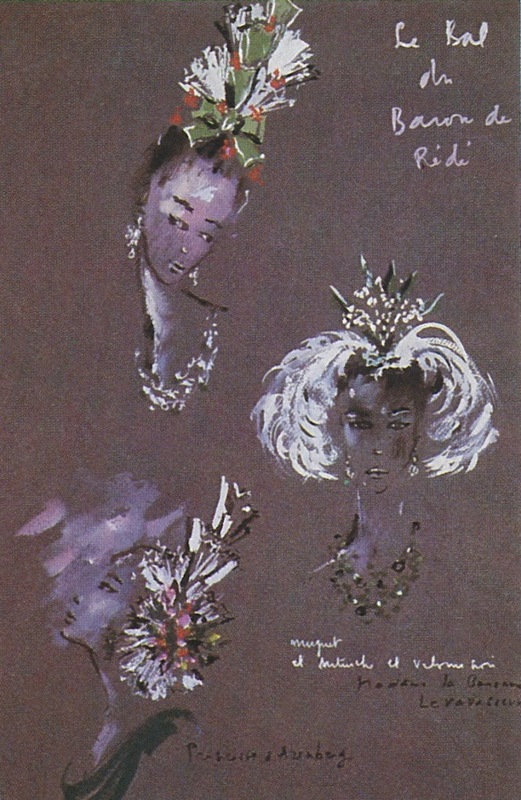 You can see sketches of his headdress designs below. 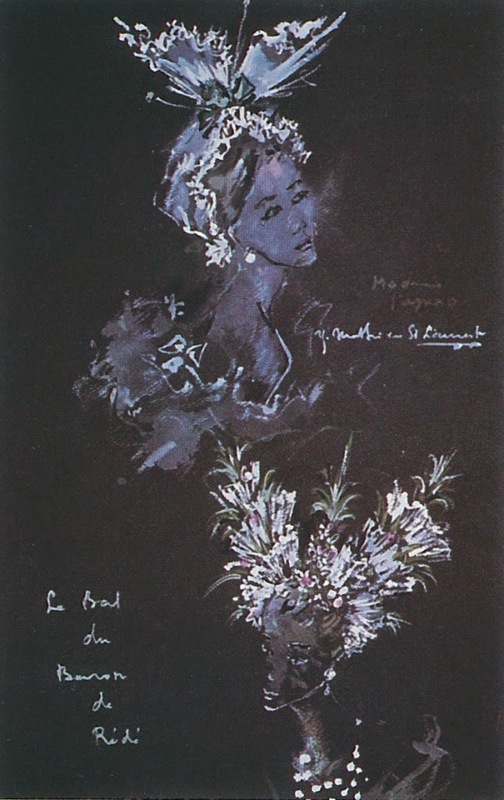 He also illustrated a rendering which depicted the theme of the party (see the two images above.) 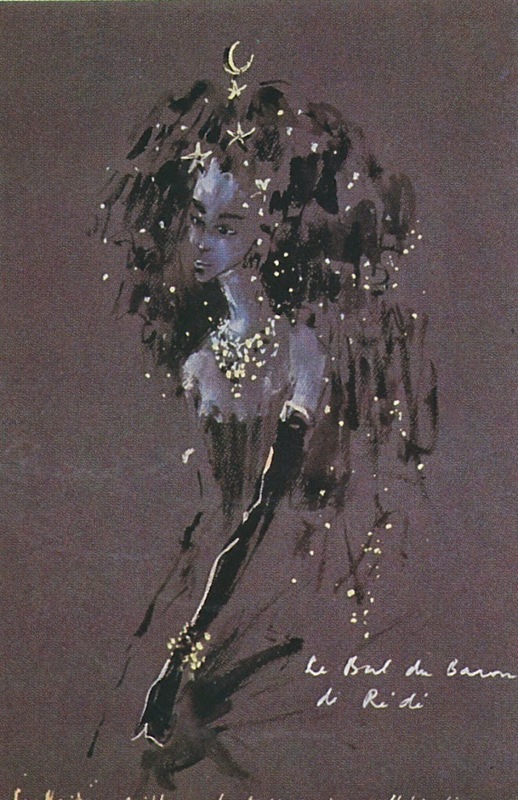 If you own a copy of Redé's hard-to-find memoirs, then you know that this illustration was used for the book's endpapers. 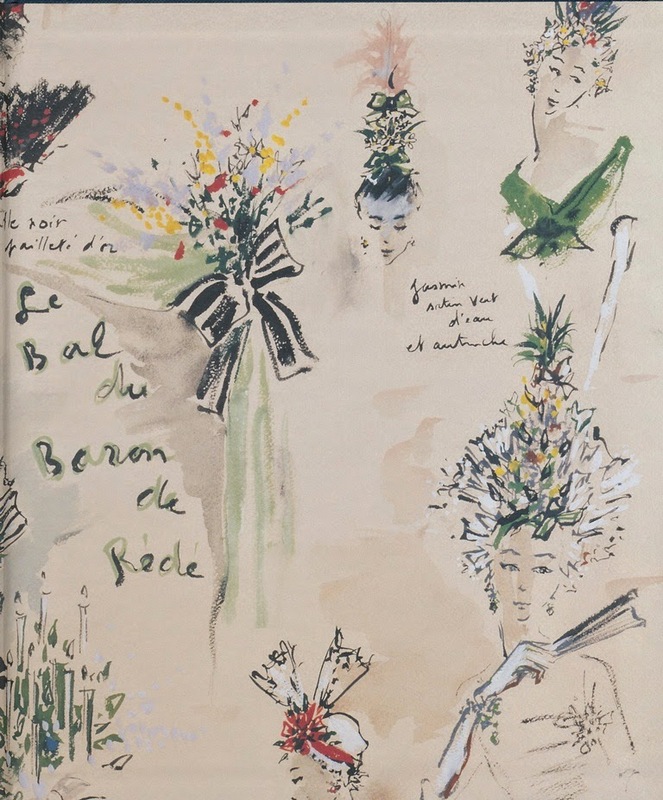 Of the fancy-dress balls that he and his ilk hosted, Redé wrote that they were "the excuse for dressing up and competing for imaginative outfits." Although the days of such balls are long gone, it does make me pine for the days when people actually made an effort with their appearances, especially when going to a ball. 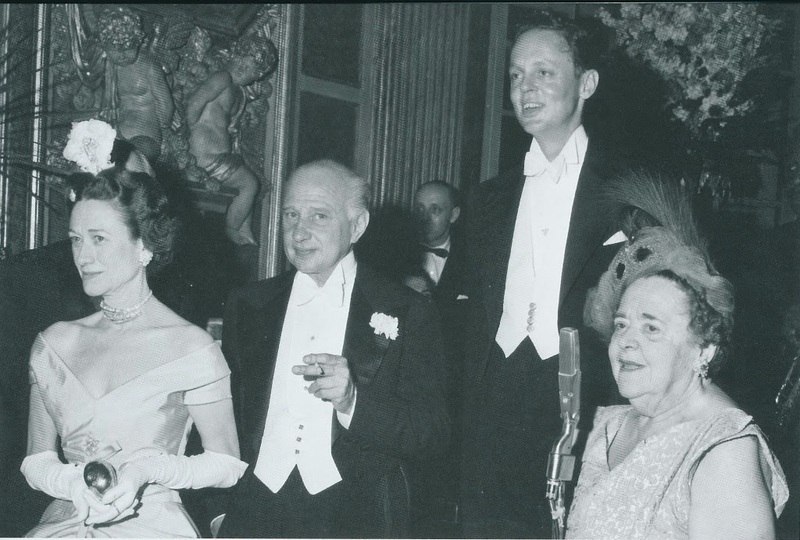 Baron de Redé with his fellow judges, the Duchess of Windsor, Charles de Beistegui, and Elsa Maxwell. 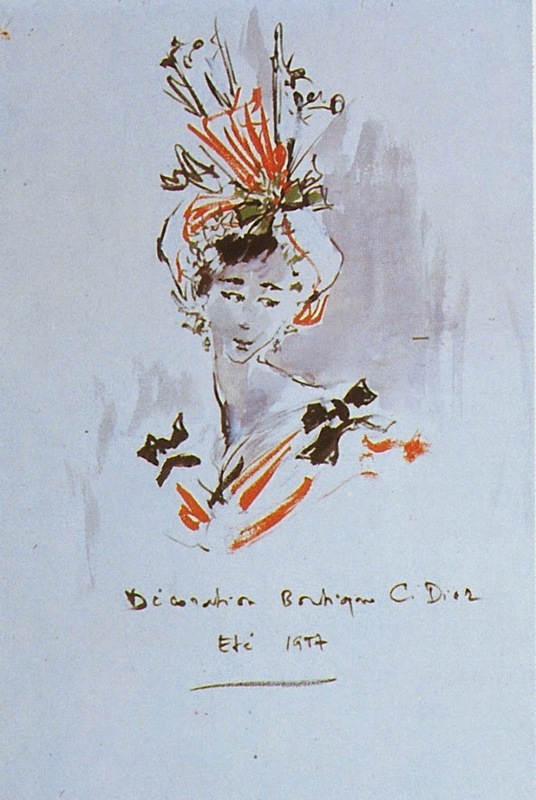 Jacqueline de Ribes and her winning headdress. 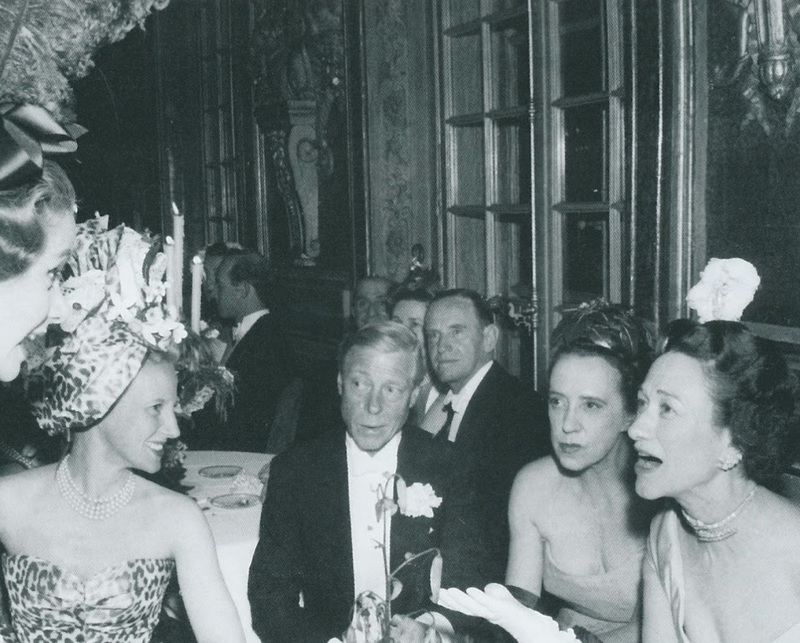 Bal des Têtes guests included Princess Ghislaine de Polignac, the Duke of Windsor, Elsa Schiaparelli, and the Duchess of Windsor. 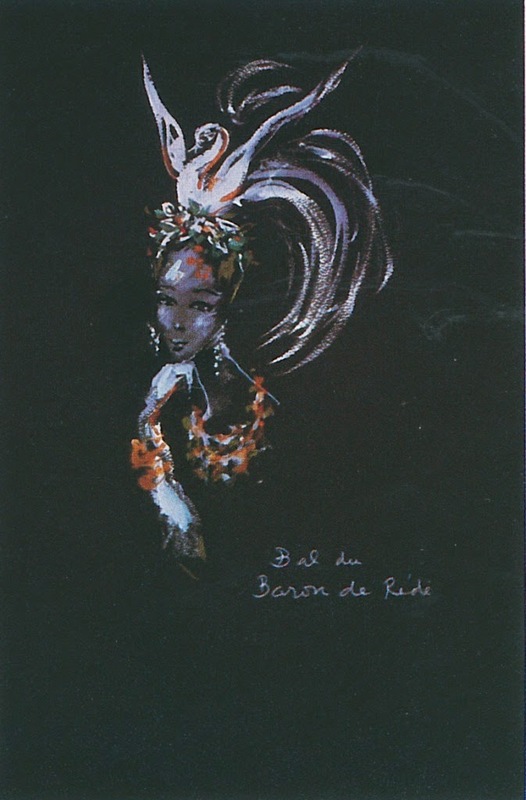 Jennifer I adore de Ribes headdress! So fabulous. It distresses me to see what some women wear to galas these days! What a beautiful headdress! She looks so stunning in that dress too. What a great post. I can see Hotel Lambert from my window...I wonder when it will ever be repaired from the fire 2 years ago..
That is so neat! Love the drawings.